Working from home gives you the opportunity to really get to know your pets and all their quirks. When I worked out of the house I was certain that the dogs would sleep all day and then be ready to play by the time I got home. Being home means they don't sleep as often and they're ready to play, bark at the mailman or pathetically beg for a tiny morsel of my lunch. Lola was laying on the floor with her neck stretched as far as it would go just so she could rest her chin on the edge of my chair. It looked really uncomfortable and entirely hilarious. Getting organized is a constant struggle for me. Is it for you, too? I always think that once I'm organized I should stay organized but of course that's not the way it works. There's always something new to do, a new project coming in, a phone call with another request and before I know it I have notes spread across my desk on top off all the other things I was supposed to do today. A to-do list is ever-changing and always expanding so it's silly to think that I'll ever be finished getting organized. I've tried a million different things to help me stay on top of my tasks, everything from paper journals to iPhone calendars that sync to five other apps and various things always fall by the wayside. A project doesn't get done, I'm rushing to meet a deadline or maybe I forget to make a phone call and then I start to stress about when I'm going to fit another task in to my already busy day. The life of a small business owner is a little insane and there's no time add more tasks. The Weekly Dumplist. Click here to download the PDF. This is your new master to-do list! I made the Weekly Dumplist a downloadable PDF so you can print off a new page each week because starting with a fresh list each Monday is the key to success. In the top right you can write down your project and the date. I usually have three sheets like this for each week. One for my Heather Ink, my graphic design business, another for my largest freelance client, and the third for Ewe Ewe Yarns. 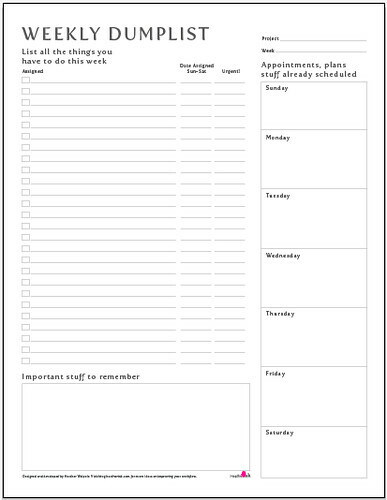 I have enough tasks each week for each business to fill up an individual page so three it is. On the righthand column is a brief overview for the week, take a minute and write down any appointments or other items that are already scheduled. There's a box for each day giving you plenty of room to make notes. Add doctor visits, birthdays, or even family dinner here in this section. Then comes the big list, the dumplist. Start at the top line and add a task, then another one. Get all of the things you need to do out of your brain and on to this piece of paper. 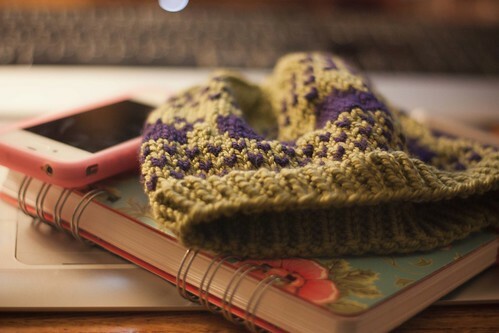 As you start writing you'll start to remember more things that you need to do so keep writing. Write EVERYTHING you need to do on this list. It might not all get done this week but by writing everything down you won't forget something. Ok, do you have everything down? There's nothing else floating around in your mind? Yes there is, write it down! Now let's segment the items up into days. Read down your list. Are any of the items urgent? If they are then put an X on the corresponding line in the Urgent column. Read through your list again and think about which items need to be done first and which can be accomplished later in the week. Assign a day to them in the Date Assigned column, I use M, T, W, Th, F as my shorthand. Take into consideration how long a task will take you to complete and maybe put one longer project on each day. Also be sure to space out your tasks throughout the week, not everything needs to be done on Monday. The next step is to get your calendar and file the tasks you've labeled M on to Monday in your calendar. It doesn't matter if you use a paper calendar or an electronic one, all that matters is that you transfer each item to its assigned day. After you've assigned the task to the calendar then put an X in the Assigned column, I scratch out the whole line too. When you're done you'll have your week planned out and no task will be left undone. As the days pass cross off the tasks on your calendar. You're done with the item so it's time to move to the next one and by the Friday you should have everything done! What about new items for next week? There's always emails coming in and clients calling with new ideas, right? Well I keep my Weekly Dumplist nearby and jot down tasks for next week. Then on Monday morning when I'm making my fresh list I put those items first and then start listing other tasks. Before you know it you'll stop worrying about what needs to be done because things are getting done! I really hope the Weekly Dumplist can help you with your overcrowded schedule. Just remember that everyone is trying to stay organized and on top of a mountain of work tasks, home projects and family commitments. You're not alone and your work here is never done! Click here to download the Weekly Dumplist.